DEBBIE GIBSON "SHAKE YOUR LOVE"
Debbie Gibson achieved success with seven top 40 hit singles in the UK (8 in the U.S.) between 1987 and 1989. 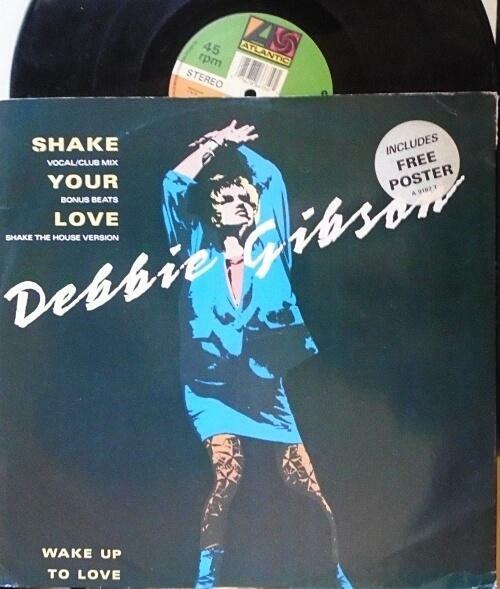 "Shake Your Love" was Debbie's second single release (her first hit in the UK), and featured on her debut album Out Of The Blue. The single reached No.4 in the U.S., No.3 in Ireland, and No.10 in Canada. In the UK, the single entered the chart at No.35 on 17th January 1988, making it the highest new entry that week. However, there were only two Top 40 entries that week, with "Wild Hearted Woman" by All About Eve entering at No.36. "Shake Your Love" reached No.7 on 7th Feb 1988 for one week, and spent 8 weeks in the UK singles chart. The track was written by Debbie Gibson, and produced by Fred Zarr. It was recorded in March 1987. The single version is just 5 seconds shorter than the album version. The song itself reminds me very much of Madonna's sound at the time, although she had nothing to with it whatsoever. The B-side on the 7 inch vinyl in the U.S. featured the Bad Dubb Version (5:03). In the UK, "Wake Up To The Love" (3:42) was included instead. The video is an energetic affair, and it's basically a dance routine from start to finish. That's no surprise, given that it was choreographed by Paul Abdul. Abdul, of course, had her own chart hits during 1988 and 1989, which included "Straight Up" and "Opposites Attract". I find all that leaping around and flashing lights headache inducing these days, sadly, now that I'm a pot-bellied misery guts in his 50s - move over Victor Meldrew! However, the song itself I still find enjoyable. This UK 12" vinyl (with free poster) featured the Vocal.Club Mix, Bonus Beats, and Shake The House Version. Amazingly, Gibson's Out Of The Blue album was penned, produced and recorded in 4 weeks. The album achieved 3 x platinum sales in the U.S., where it reached No.7. In the UK, the album was not quite as successful, but still reached No.26 and achieving gold, so it was far from a flop. Gibson's debut single "Only In My Dreams" initially failed to chart in the UK Top 40, but became a hit following the success of "Shake Your Love", reaching No.11 on 3rd April 1988.